Whenever an unexpected film makes an impression on the Academy in the form of some high profile Oscar nominations, the entertainment industry takes notice. And when that unexpected film is French, black and white, and silent, well, it’s safe to say that the notice is unprecedented. 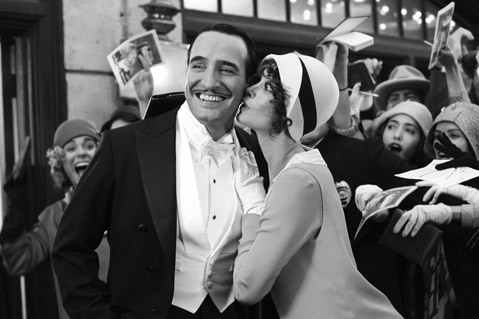 The Artist, directed by Michel Hazanavicius, and starring Bérénice Bejo and Jean Dujardin, tells the story of George Valentin, a silent film star whose career begins to slide with the advent of the talkies. George comes very close to losing everything, including his life, but his faithful dog and his guardian angel, the rising young actress Peppy Miller (played by Bejo) save him at the last minute. A silent film with a familiar, melodramatic plot that’s set in the early 20th century shouldn’t play in the overheated and 3D-saturated film market of the early 21st century, but somehow it does. Whether that’s because of the genius script by Hazanavicius, a true auteur in the grand tradition, or because of the outstanding performances by Dujardin and Bejo that will be honored on Saturday night with the Santa Barbara International Film Festival’s Cinema Vanguard Award, in the end does not matter. This unheralded team of passionate cinephiles have stolen the awards season spotlight, and already racked up an impressive array of honors, including top prizes from the Directors’ Guild for Hazanavicius and from the Screen Actors’ Guild for Jean Dujardin. I caught up with Dujardin by telephone on the Monday after his victory at the SAG Awards. At the Screen Actors Guild Awards last night, you won for the “Best Performance by a Male Actor in a Leading Role,” a pretty major category. How did that feel? It was almost too much. When I looked around at the other nominees — George Clooney, Demián Bichir, Leonardo DiCaprio, and Brad Pitt — and thought about how great it was to get this far, and to be in that group, that was already exciting. But then to be told that I won, and to stand up and receive such an honor in front of all these great performers, that was beyond words. I want everyone to understand that I really do know what happened last night, and that I appreciate how special this all is. They say this SAG award is a good predictor of the Oscar winner. Do you care to comment on that? Like I said, I am very aware of the magnitude of these things in the film world, and how much it all matters. But honestly, for me, I am not made that way to think too much about it, or about what might happen, and I’m very sincere in this. I don’t go there in my head because that’s the best way for me to stay grounded, to keep my feet planted in my own garden, so to say. But believe me, I am enjoying it. I am an actor, and I am fully in the moment for this performance as much as for any. How did you prepare for a role with no lines to learn? It was a challenge, the preparation, because it could not be as you say, the learning of lines. What I did instead is I went to the cinematheque and I went to school with the great silent actors, watching not just Chaplin and Keaton, who I did not want to imitate, but also things like Murnau’s Sunrise, the films of King Vidor, and other wonderful early silent films that Michel Hazanavicius selected for us. From there I specialized, looking specifically at actors, but now from all eras, and searching among them with an eye for the visual and for the best of everything. For example, I chose Gene Kelly for his smile, the great Italian actor Vittorio Gassman for his expressive style, and of course Douglas Fairbanks for everything — for being Douglas Fairbanks. I saw every one of his movies that I could because he always played essentially the same character, the Douglas Fairbanks lead, and I wanted to model George Valentin on that — I saw him as that type of silent actor, the one who is always essentially playing some version of himself. So preparing for this was very much about absorbing the way that these actors moved, and then internalizing that, but it’s fun for me. I live to act in this physical style. And mentally, did you do anything special to understand you character George Valentin’s mind? Yes, I used the fact that we were filming in Hollywood, and I had fun pretending to be a movie star. I traveled to the Warner studios everyday acting like I was a movie star from that era, and, because I was there, actually living and working in the places where this history happened, I think it was easy to fill my subconscious that way. And this was very helpful, because when I arrived on set, I was ready to be George. George takes a bad turn in the movie, and falls pretty far from where he starts. How was it playing someone who is going through that kind of collapse? You have to be careful, because the negative emotions of a character can really pollute you if you aren’t. I know these dark places — we all have them, and you use a little of everything that you know about them to get there in performance. The big thing I think about playing someone who is down like that is that as an actor, you cannot hold anything in reserve for that. You must let it all out, and give it everything. Otherwise it is untrue. But, that said, you must leave the sadness on the set. Don’t bring it home! Talk about the performance of your co-star, Bérénice Bejo. What was it like to see her become Peppy Miller? It is interesting that you ask the question in that way, because actually we do not have all that many scenes together in the film, so the way that we connected really did have to do with watching each other. Every opportunity that I had to be on the set for one of her scenes, I took, and she did the same. Even when we weren’t acting together, which was most of the time, we were watching each other’s takes and learning from each other’s performances. That’s how we made the love story real — by learning to look at each other in the right way. How about that marvelous tap dancing sequence? What does it mean to you in the film? And how did it feel to perform it? To me, the dance represents the union of the couple — it’s as simple as that. It is like them making love. As for the feeling of performing it, well, neither of us were great tap dancers — both of us learned to dance for the movie. So the goal was never to be the best at that part of it. Instead, what we aimed for was a good enough performance of the steps, but with the addition of the smiles and the energy that came from the characters and the story. With that material to compensate, the dance becomes more likeable, because of course in the story it really means something. Are you looking forward to the Cinema Vanguard Awards here in Santa Barbara? Oh yes, very much. I want to go all the way to the end of this adventure savoring every moment. When you have something like this happen, you don’t read scripts or look for new work, you just enjoy it. Every day of something like this is a gift, and I intend to have a great time in Santa Barbara. [Sings the theme from the soap opera “Santa Barbara,” then laughs.] I’m sure you know this, but that’s a very popular show in Europe, everyone knows it. The Cinema Vanguard Award will be presented to Jean Dujardin and Bérénice Bejo at the Arlington Theatre on Saturday, February 4 at 8 p.m.